Brighton captain Bruno was always confident the side would respond positively this year after their heartbreaking finish to last season. The Seagulls missed out on promotion to the Premier League only on goal difference, before they lost in the play-offs to Sheffield Wednesday. Albion quickly put that disappointment behind them and, after dropping to 13th with just eight points from six games in September, have since collected 84 points from 37 games to seal promotion to the top flight of English football with three games to spare. 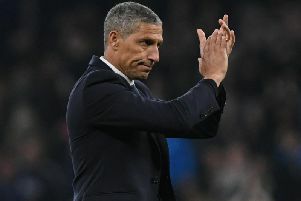 Brighton need just three points from their final three matches to be crowned champions and on playing in the Premier League next season, 36-year-old Bruno said: "It's a dream but it's not just for myself. "It's a big achievement for myself but for my team-mates, for the manager, for the stadium, for the city, for the fans, for everyone, it's unbelievable. "We had two options in the summer, to come back stronger or just give up. "But I knew that this club and these players would come back stronger and we've shown that. "It's so emotional. You think a lot about how hard we were working for that and how many players have worked for this. Not just us, it's not just about ourselves but the players that have been working and fighting for this club last year, two seasons ago, three, four, five, 20 years ago, in different stadiums and not these facilities. "It's unbelievable, it's for all of them as well and they deserve that. We're enjoying this moment but they should enjoy it as well." Bruno also reserved special praise for the Albion fans and said: "They've been unbelievable. "Like us, they're over the moon and they deserve it. The club went through some tough times and they were there then and they deserve to enjoy this."